As an MSP you need to deliver a great customer experience (CX) to keep clients happy and there are a number of ‘brand touch points’ for you to choose from. One of those touch points is your PSA web portal and today we’ll focus on why ‘web portals’ simply don’t work or add much value. Customer experience (CX) is the product of an interaction between an organization and a customer over the duration of their relationship. The environments the customer experiences during their experience (e.g. physical or digital environment). Let’s be honest how many of your clients use the PSA Portal to contact you – hardly any I hear. Well most people think it’s because the PSA Portal is not a great experience, doesn’t work well and looks terrible. In some ways this is correct, but it’s not the main reason why they don’t use it. They don’t use it because they can’t find it! How do you standardize a URL across all devices? How do you train users to find it? Do they have to login to access? The reality is the PSA Portal, along with the web portal version of DeskDirector and the SharePoint portal of CloudRadial don’t work simply because users can’t find them. Even if a user can find it, they either have to login OR navigate a maze of menu options. Can’t find = low utilization. Too hard to access = low utilization. Easier alternatives (phone/email) = low utilization. It’s that simple. Web portals don’t work. Web portals might have some great features but if no one can find it, those amazing features become redundant. To prove the point a recent article in Channele2e references a study by FreshService where they found that 70% of all support tickets logged in their platform came via email. But it’s not all doom and gloom, there is a solution to deliver a better ‘one pane of glass’ brand touch point for your MSP. Think about the current challenge Microsoft has to change the behavior of users to operate entirely in the browser with Office365. As an MSP have you ever been able to get clients to completely drop the native App of Outlook, Word, Excel in favor of the browser? To be fair the browser version of Office365 isn’t too bad but I believe from my own MSP experience (I still have an MSP with 5000 desktops under management) that users prefer Apps because they are easy to find, open and use. People will always go down the easiest path for support, so if you want to deliver a better customer experience (CX) you need to copy what works – give them a native App. This is why we invented ITSupportPanel for our MSP. We made the bet that a desktop and mobile App would solve this behavioral problem. We were right. Customers love it and they use it A LOT. 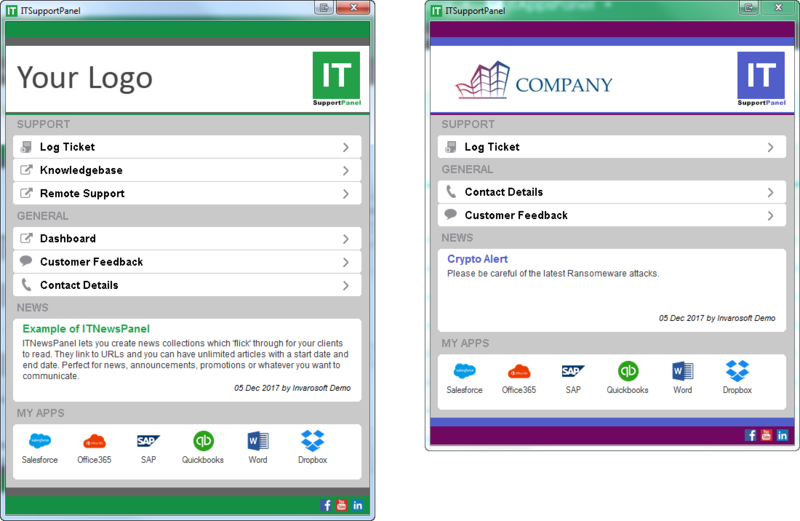 We get 110 tickets per day on our Service Desk and 60% come via ITSupportPanel. Before we used to get 85% over the phone & email. The conclusion we made was they loved it because it was easy to find, they didn’t need to login and it was easy to use on any device. It’s been our MSPs differentiator or Purple Cow for years! We grew from $3M to $7M in 4 years because of it! So after all of that, I need to be clear on one point. The PSA web portal isn’t a great brand touch point, but there are plenty of other web portals that add a lot of value to clients such as; IT Glue, Wise-Sync, BiggerBrains, Brightgauge etc etc. They all suffer the same problem – users can’t find them. This is where ITSupportPanel solves this problem. You can easily create a custom button that links to a portal and ‘hey presto’ you just made it easy for clients to find and use. We are building smart integrations with these vendors so users can click a button and auto-authenticate into their portals. No friction and easy to find = higher utilization. So the decision you have to make for your MSP is do you continue with your early 2000s customer experience and brand touch points (Web Portals & Email) OR replace them with a modern desktop and mobile App that actually gets used? Feel free to watch The 5 Mistakes MSPs Make – Customer Experience (CX) if you want to learn more.